Situation in the Persian Gulf runs high slowly and surely. Menaces repeatedly voiced by Iran's politicians and military leaders threatening to block the Strait of Hormuz as a response to embargo on Iranian oil exports and, thus, cutting off oil deliveries of other suppliers to the West, made the US and allies take real actions. US Navy reinforces its assets deployed in Iran's adjacent waters. Meanwhile, both sides are provoking each other, so the conflict may enter the "hot" phase soon. US Navy is about to counter Iran's plans to block oil traffic. The stakes are too high, since even brief interruption in oil deliveries would cause a crisis at global market and raise a question of America's competence as a "world gendarme". Combat capabilities of US Navy are widely known. Of course, in case of full-fledged war against Western coalition, Iran would have little chance for success. But in certain circumstances, however, Iran's naval force would be quite capable to paralyze oil deliveries, at least, at initial stages. It is hard to overestimate significance of the Strait of Hormuz for global economy. According to Lloyd’s statistics, in 2006 up to 33% of world oil export was transported through the Strait of Hormuz. Taking into account all kinds of oil products, share of the strait is about 40% of global oil shipment. The Strait of Hormuz is narrow but strategically and economically vital natural traffic artery connecting southeastern part of the Gulf of Oman with southwestern part of the Persian Gulf. Northern part of the strait belongs to Iran, the southern one – to United Arab Emirates and Sultanate of Oman. The strait is 195 km long, width of the narrowest part is about 54 km. Maximal depth is 230 meters. The strait is divided in two 2.5-km wide transport canals separated by 5-km buffer zone. Presently, the strait is the only sea route allowing export of Arabian gas and oil to third countries including the US. What forces Iranian Navy and Revolutionary Guard's Navy can match against? What are their capabilities? – lending close support to land forces and aviation at coastal theaters, conducting of landing assault operations, countering opponent's landing troops, maintaining continuous maritime surveillance. 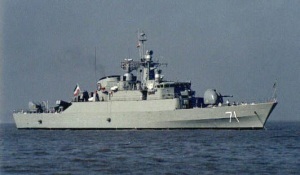 Structurally, the Islamic Republic of Iran Navy (IRIN) comprises the headquarters, four commands, and four naval areas; IRIN includes surface and submarine forces, naval aviation, marine corps, coast-based antiship missile units, coast guard, land-based services, and administrative agencies. Except for the Navy subordinated to national defense ministry, Iran is protected at sea by Revolutionary Guard Corps' Navy. In recent years, Iran places particular emphasis upon reinforcement of its naval forces. New surface ships and midget submarines are built, various missiles are tested, ships regularly carry out long-range cruises and tactical naval exercises. Iranian naval forces in the Persian and the Oman gulfs are stationed at several bases (the main one is Bandar-Abbas where IRIN headquarters is located), and on islands; other basing sites are being constructed as well. Main force of Iran's surface combatants is concentrated in the same area. The core of submarine force is three Project 877EKM diesel electric submarines built in 90's. Subs of that project are considered low-noise assets and have powerful weapons posing a serious threat. Those submarines are quite effective against warships and can be used against tankers. In addition to Project 877EKM diesel subs, Iran operates tens of midget submarines, including those in service of Revolutionary Guard's Navy for special operations. Surface fleet is represented by several large-size warships both domestically-built and remained from the shah regime. It is noteworthy to mention two Jamaran-class destroyers (in fact, frigates), about 10 frigates and corvettes. Main surface attack force is numerous (50-70) fast-speed missile boats. All vessels are armed with various anti-ship missiles made in Iran and imported from abroad. When massively used, they can inflict appreciable damage to US and NATO naval force and, undoubtedly, disrupt oil shipment. Amphibious fleet is represented by significant amount of ships and boats. About 15 of them are relatively large-size vessels (displacement of 1,400-2,500 tons) capable to perform landing of troops and light vehicles. Significant part of amphibious force is boats including air cushion ones. Iranian landing boats would unlikely be a threat to US Navy, but could be helpful in mine-laying. 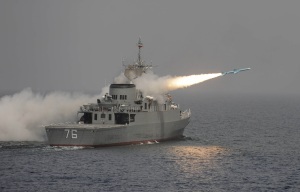 In addition to sea-based antiship missiles, IRIN and Revolutionary Guard's Navy have in inventory dozens coastal mobile antiship missile systems with strike potential of 200-250 missiles in salvo (various sources report of about 150 launchers constituting 4 brigades). That poses weighty threat to allied warships and regional oil traffic. Another one and perhaps the only effective way to block the Strait of Hormuz completely is mine planting. Iran has accumulated huge mine arsenals (although obsolete), and almost all Iranian ships are adapted for mine-laying. By the way, mining may take quite short period, and even first or second wrecked supertanker may paralyze all traffic in the region. Besides, mines would seriously hinder actions of America's fleet. Generally, condition of Iran's naval assets is far behind the potential enemy. Iranian Navy lacks experience of present-day naval engagement, has weak ASW capability, and undergoes problems with umbrella cover.